Once again, London walks in terror as prostitutes are murdered in another section of Whitechapel. The public fears the Ripper has returned, though Scotland Yard vehemently denies it. Both are unaware Colin Pendragon has ol’ Jack securely committed to an asylum for the insane from which he’ll never escape. Though still recovering from gunshot wounds from the previous case involving Charlotte Hutton, a woman proving herself Colin’s bane and a most formidable foe, he responds when Inspector Evans asks him to assist. Leaving his sickbed too early, Colin collapses from the incipient infection of his wounds. He spends a good part of the investigation in the hospital while Ethan Pruitt, his partner, becomes his proxy. Following up on the missing grandson, Ethan is unfortunate to witness the young man’s murder. Now they are trying to discover the identity of two killers. Further investigation will take the two sleuths into the opium dens of Whitechapel, as well as into Buckingham Palace, where an anxious Queen Victoria admits she suspects one of her relatives may be involved. 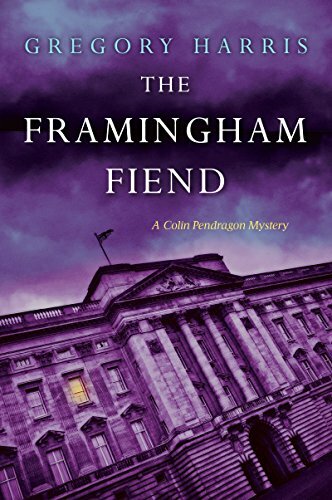 Discretion is called for, as well as the quick closing of each case, but the Framingham Fiend will strike again, and again, before the fatal clues are discovered that will solve both cases. Though Sherlockian in nature, this series of mysteries has its own individual appeal because of its unique characters. Ethan Pruitt narrates the stories, but he’s not simply a spectator. Ethan is capable of his own detecting, getting into the fray right beside Colin, if necessary. He and Colin are life-partners, a gay couple in a time when such an arrangement was not only illegal but worthy of a prison sentence. No one is aware of this but Colin’s father and his housekeeper who was also his nanny when he was a child. Everyone else is blithely unaware, including Inspector Evans, and the two keep it so. Their relationship doesn’t detract from the storyline, however, and is mentioned almost incidentally by a couple of references made by Colin, and a single incident when there’s mad scramble to remove Ethan’s possessions from the master bedroom when a nurse is sent to the Pendragon home to care for Colin. More important to the storyline is Ethan’s once addiction to opium and how his return to the opium dens during his investigation affects him. The characters are individually well-delineated, with contemporary references in literature and personages giving authenticity. Inspector Evans is a likable chap, occasionally a little chagrined by the way Colin takes over the investigator but realizing it’s for the best, he’s generally good-natured about it. The coroner, Ross, is an irascible and very unpleasant character with an obvious dislike of Colin though the reason is never quite clear. Is it professional jealousy? The fact that he’s not an official but a private citizen “butting in” on police business? Ethan, as previously stated, isn’t merely a chronicler of the story but a very active participant, and Colin himself is a well-rounded character—smart, observant, though he doesn’t expound on his knowledge to the point of being a show-off, a man who cares for both his father and his housekeeper while they, in turn, worry about him even as they encourage him. A secondary but no less important part of the dramatis personae is Paul, a street urchin involved in the case through his personal relationship to one of the victims. His retorts bring a welcome break in the solemnity of the narrative and make him a most endearing character. The detection methods border on many of those used to day, though couched in terms of items newly invented and only recently put into use in that century—electric lighting, photography, fingerprinting, etc. Both crimes are neither convoluted nor particularly complicated, but the story is presented in such a way there’s a good chance the reader won’t guess the perpetrator in either case, and both villains will come as a surprise. All in all, it’s an exciting, and entertaining story, whose finish will urge the reader to eagerly await the next alliterative title in the series.